Including songs by Israel Kamakawiwo'ole "Somewhere Over The Rainbow"Jason Maraz,James Taylor,Jimmy Buffet,Louis Armstrong,Cat Stevens,Howie Day,Frank Sinatra,Dylan,Bill Withers,Johnny Cash,Clapton,Sade,Neil Diamond,Bob Marley,Pink Floyd,Sublime,Jimmy Cliff,Hootie,DMB Al Green,Marvin Gay etc. Franklin was the epitome of professionalism and played so beautifully for our dinner party wedding reception. Franklin was early to the venue and came prepared with his own equipment, and even though we had our own speaker system on site he had his on hand just in case we needed it.... which I love. When you are in wedding mode, there is a lot to be said for true peace of mind. Our guests also kept commenting throughout the night how amazing Franklin's playing was, and now as we look back on the day Franklin's music was definitely one of the major highlights of our wedding. If you are looking for a truly intimate background music moment for your adult dinner event, hire Franklin immediately. We couldn't have dreamt of a better performer to entertain our family and friends. Franklin exceeded my expectations. I hired him to play a song during a surprise proposal to my girlfriend. He proved his supreme versatility by learning the song I requested and carrying out the performance right inline with what I wanted. I highly recommend him for any type of venue. Franklin was a highlight of our wedding! I can not say enough good things about Franklin. He was an absolute highlight of our small, intimate wedding at the Naples Beach Hotel this past weekend. Working with Franklin prior to the event could not have been easier. It was completely stress free, he was totally pleasant and very, very quick with his responses. He happily learned a song for our processional and did an incredible job at it. He blew everyone away at our cocktail party, to the point where we just had to ask him to stay and play for us during dinner. I wish I could have more events where he could play! He was just amazing. Everyone loved him, young and old. Thank you so much Franklin. Everyone at our wedding made a comment at how wonderful you were and what a performance you put on. This was as seamless as it gets from beginning to end. Franklin was superb in every way. He will have my vote and a favorable reference from this point forward. He is personable, reliable, extremely well organized and very professional. You are all to be commended for your service and efforts. Insurance: one million - 1 million dollar liability. My clients can expect me to play music that will cross all (link hidden)st people that see my show are amazed at my broad reportoire which enables me to leave an impression on (link hidden)e most common things people say to the event planner is "where did you find him"and "he's amazing". 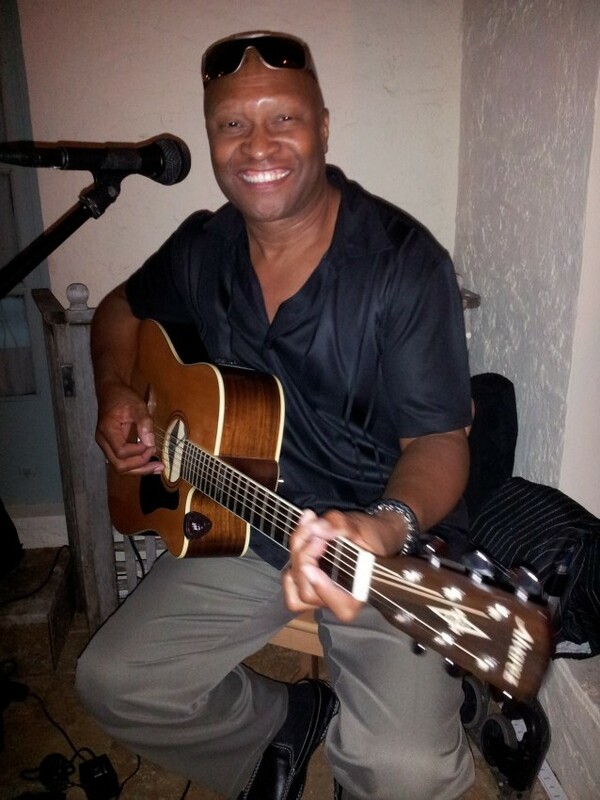 My name is Franklin and I am currently performing weekly at BB Kings & Blue Martini in WPB and the Catalina Hotel in SOBE.I can help to provide quality musical entertainment for your party, event or venue - as a solo performer or with accompanyment. The selections that I perform range from quiet dinner music to the upbeat tempos requested at festivals and special events. My repertoire includes easy listening, blues, ballads, rhythm & blues and classic rock. A song list is available upon request to better help tailor my performance to your event or venue format. I welcome the opportunity to work with you to craft a performance and selection of music that will suit your individual needs and also leave room for audience requests, with the goal of increasing your nightly draw. My objective is to increase your bottom line by building an intimate rapport with your core customer base, thereby maximizing your potential for repeat visits. I am currently available for bookings at supper clubs, night clubs, summer festivals, corporate and school events (high school/college), weddings and private parties.